So here we are half way through 2013 and I've only just noticed the list of the best sewing patterns of 2012 over at Pattern Review which went up in February - clearly I live in my own little world for most of the time (and happily too, I might add!). Maria - I love your black and white print Peony dress featured there, and Melanie's Renfrew top pictured in Machu Picchu no less! Anyway when I spied New Look 6808 there - a top designed for wovens with a variety of collars I knew I had to try it. Lately I've been thinking that I need a variety of tops in my wardrobe, and since knit fabrics and I are warming up to each other but are still not BFFs a woven top is just what I need. Size wise I found this pattern to run a little large. 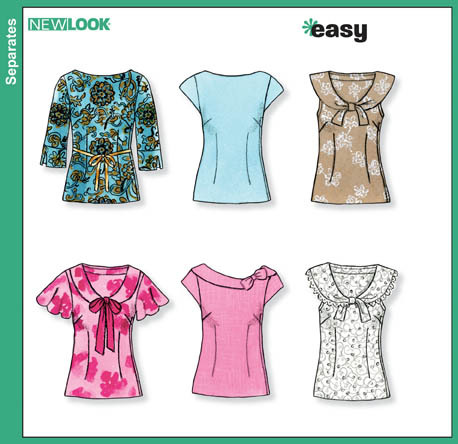 I've made quite a few successful New Look patterns lately that needed little adjustments, with New Look 6000 and New Look 6968 being my favourite dresses fitting wise (see here, here, or here), so I just assumed that this pattern would fit as well as those two. I cut out a size 8 at the top grading out to a size 10 at the waist and then a 12 over the hips, but I probably could have gone down a size overall. This top is also very long - I cut four centimetres off the bottom before I hemmed it, and it still finishes at my lower hip which being my widest part is not so flattering unless I always wear this tucked in with whatever I pair it with. Speaking of which, I did a quick refashion to this poly-wool blend knit sunray pleated skirt in a yummy caramel colour that I found in an opshop ages ago to wear with this top. It was mid calf length but I lopped off about 15cm from the bottom and did a narrow hem, and then I used a blunt disposable razor to shave off all those annoying pills that certain fabrics get and re-pressed all of those pleats to revitalise it and now it looks as good as new. This is a cute top and really looks like you! Great top! Love those polka dots. And what a brave woman to hem and then press all those pleats. :-) Well worth it though; the skirt is pretty. Love the top on you! I have a soft spot for polka dots. Great job on revitalizing that skirt, it turned out well. Camel skirts always make me think of Carolyn Kennedy, my mid-90s style icon. She wore a fabulous pencil skirt with tall boots and a white shirt. LOve, love, love your outfit! Thrifted / home sewn. Perfect! I just googled her, she did have fabulous style didn't she? Cute top! I like the bow and the polka dots. The skirt is very pretty, too. It reminds me of the one my grandmother used to wear - I always thought it was very flattering. Ooh, I forgot about this pattern! It is in my stash somewhere, and I've been needing a fitted top pattern for some idea I can't presently think of... Your top is really cute! Great use of the old material AND skirt refashion. That top is sooo cute. Love it. 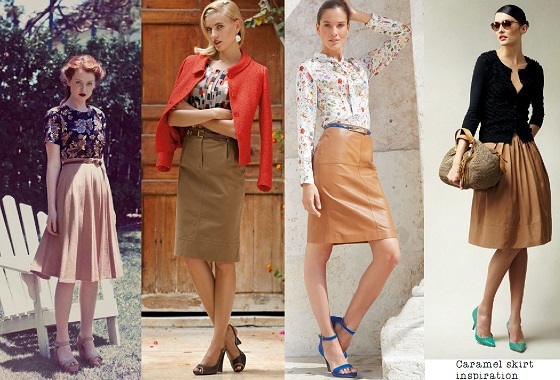 Caramel skirt is very nice too. Great find. (Love the belt!!!). I missed the announcement for the top 10 patterns and scooted over to PR to have a look. Searched for ages and couldn't find it - then came back to your site and saw the link DOH! Thanks for the link. Gorgeous top and love polka dots. Great find with the camel skirt, love that colour as well. Lovely top. What a great idea to use the fabric from an UFO. May I suggest using a bit if lemon juice on rust spots. I've used it and was quite surprised it worked and didn't discolor my fabric. Great styling Kristy. I love the bow and dots combination for the top. That skirt looks brand new! It must be because of your attention to detail. Handy tip re blunt disposable razor for pilling! Have been looking for an alternative method.. This is super cute. How can you go wrong with polka dots and a bow. Lovely outfit all together. How cool to be able to repurpose your grandmother's fabric! I certainly don't see any rust spots in the photos. I just passed up this pattern at the fabric store, but now I'm thinking I shouldn't have, if only for the adorable collar. Such a cute look! I had a great result from that pattern too. Your version is lovely. This blog post was featured on New Look's Facebook page. I will include the link to the page so you can have a look. Please invite your followers to see your post on our page. I hope you continue doing wonderful work and include New Look into your designs. Love your outfit! I've made this top twice & like it but ya, I found it runs long, for a blouse. Will be following your blog now. I use lemon juice and salt all the time to remove rust spots. Just beware that if the fabric is colored the lemon juice might slightly bleach the color. It works like magic on white and other light colors though, the spot just disappears.